Before we get to this bowl of deliciousness, let's get one thing out of the way. I don't hate rice. Rice is delicious, satisfying and (the brown rice variety) is very healthy. I love using rice in tons of ways and just about always have those frozen brown rice bags from Trader Joe's stocked in my freezer. But rice is not always the answer to every bowl situation, like when you're trying to fill a very large bowl, for example, and don't want to put yourself in a carb como. In those instances, knowing how to make cauliflower rice comes in handy. Although it seems a bit different, it's actually very easy to transform a head of cauliflower into rice and anyone can do it. You can use a food processor, cheese grater or just buy those cauliflower rice bags from TJ's that are already made. The recipe below will tell you how to make cauliflower rice using a food processor and, once you know how to do that, you can use it in all kinds of ways like Asian stir-frys, with curry or Mexican, as shown here. Just to clarify, cauliflower rice won't actually taste like rice, it more so resembles the consistency and picks up the flavors of whatever spices or sauces you pair with it. Cauliflower is amazing at this carb illusion, and you can find another one of my favorite recipes where it resembles mashed potatoes here. So back to these bowls! 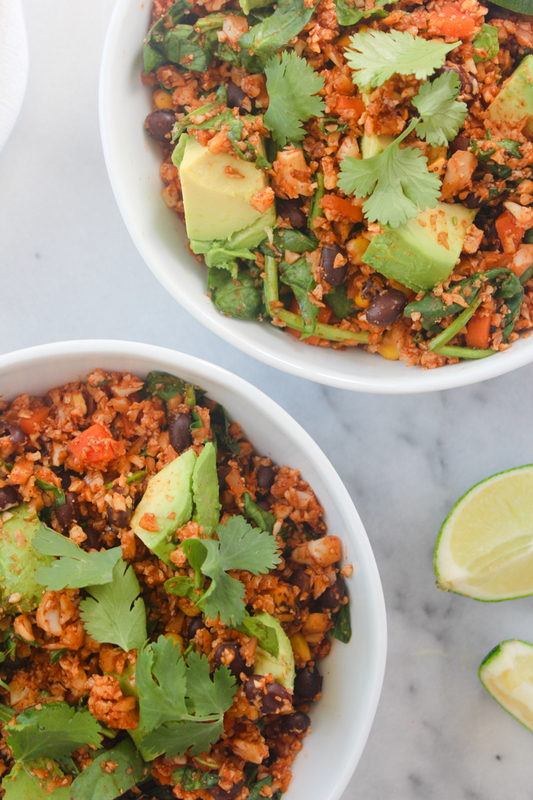 I love just about any kind of rice bowl but these mexican cauliflower rice bowls get me especially excited. I've always been a volume eater, which makes portion control a challenge. 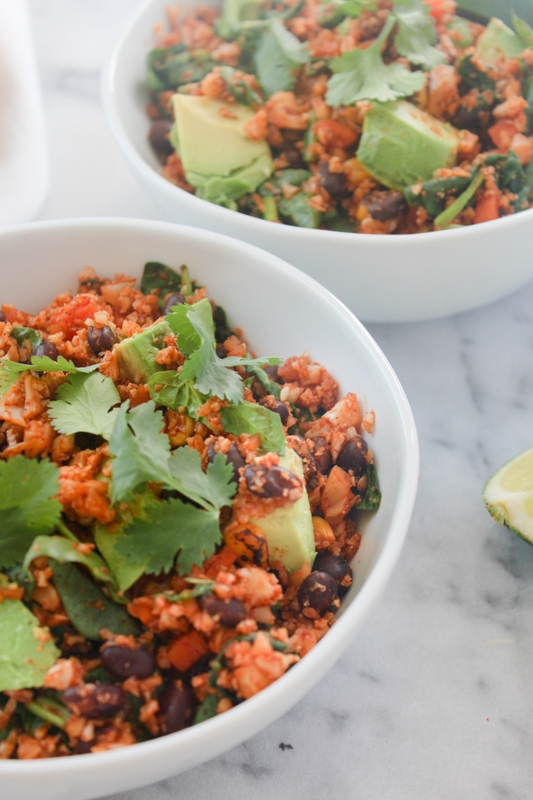 Since this recipe is essentially just tons of veggies with black beans, spices and no oil you can throw calorie counting out the window and serve yourself as much as you want. Again, I don't hate oil, just as I don't hate rice. It's just that, there is a time and a place for it where you really receive the benefits in flavor and utility and this recipe doesn't need it. Cooking the veggies in vegetable broth instead of oil results in the exact same flavors and textures (I've tried it both ways) so my thought is, why not just leave it out? Oil or no oil, this recipe has become one my favorites I find myself making weekly. 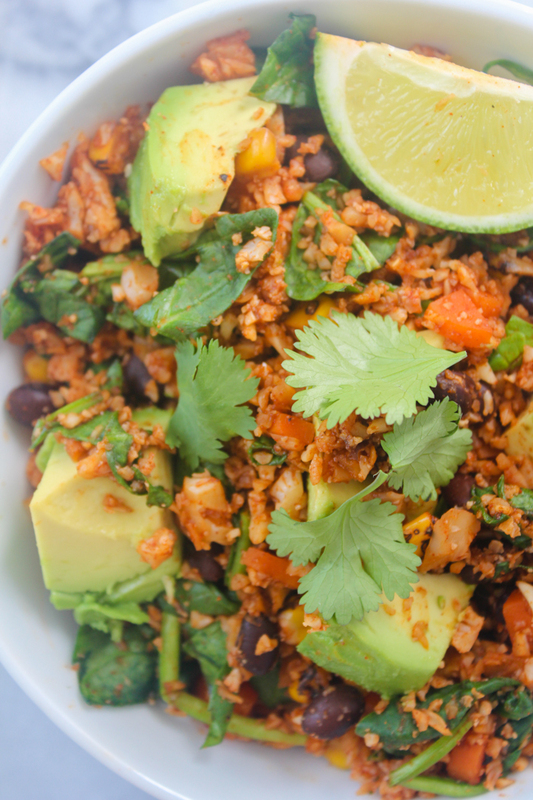 Make sure you add a generous squeeze of lime and tons of cilantro on top to really bring in that delicious freshness. 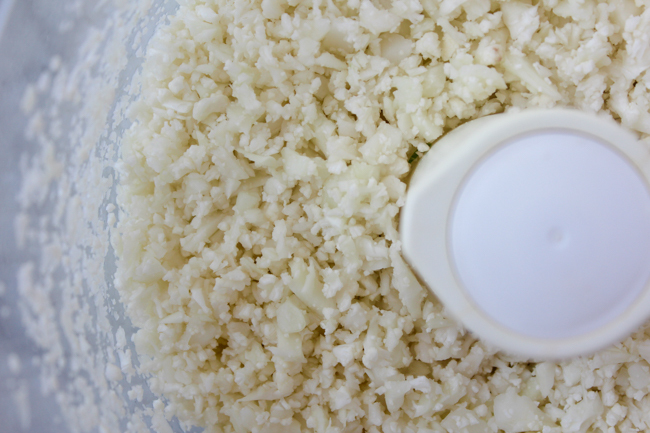 - Place cauliflower florets in a food processor and pulse until broken down to rice-sized pieces and set aside. Make sure not to over pulse here, or it can get a bit mushy when cooked. If you have a large head of cauliflower, you may need to do this in two batches. - Add 2 tablespoons of the vegetable broth to a pan over medium-high heat, adding chopped carrots once heated and cook for a couple minutes. Add the remaining two tablespoons of vegetable broth and the cauliflower rice and cook for another 5 minutes. -Stir in the black beans, corn, ancho chile powder, tomato sauce, salt and pepper and cook until everything is heated through. Finally, stir in the spinach until wilted. 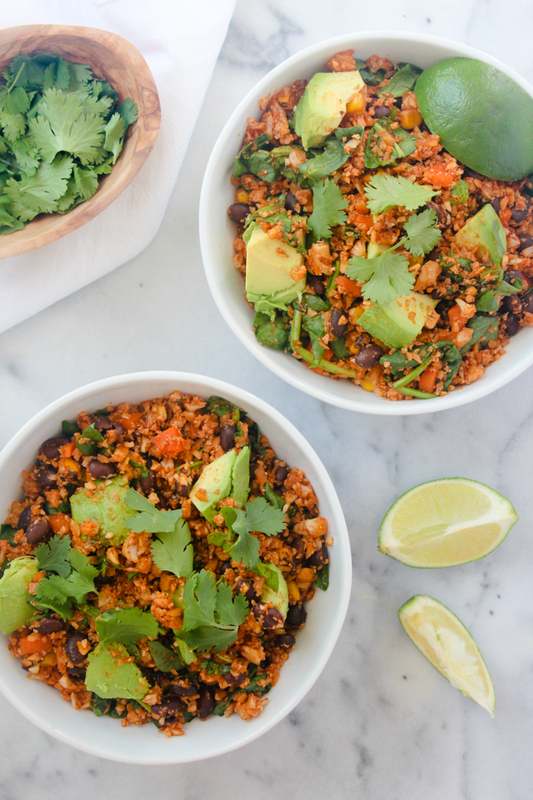 Place in bowls and top with avocado and a generous amount of cilantro and lime juice. Yum city!! Did I just say yum city?! lol... anyways, that looks delish! I actually just made a cauliflower fried rice bowl for dinner on Thursday night and it was so good even my hubby liked it! Need to try this! Girl, this looks so good! I've tried doing cauliflower rice once, but it didn't turn out that well for some reason. I really want to try your version of it though, since I am a huge fan of Mexican food. Thanks!! Definitely try this version! 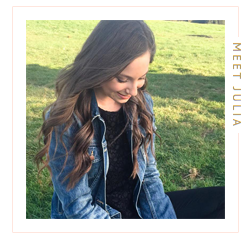 I've made it several times and it never fails :) Visited your blog and love it as well/followed your handles. Thanks for stopping by! The same thing happened to me! I held off on trying it for a while but I'm so glad I did because it's delicious. This is a great recipe to try for your first time because it's super simple! So yummy! Thanks for stopping by! This looks so delicious! 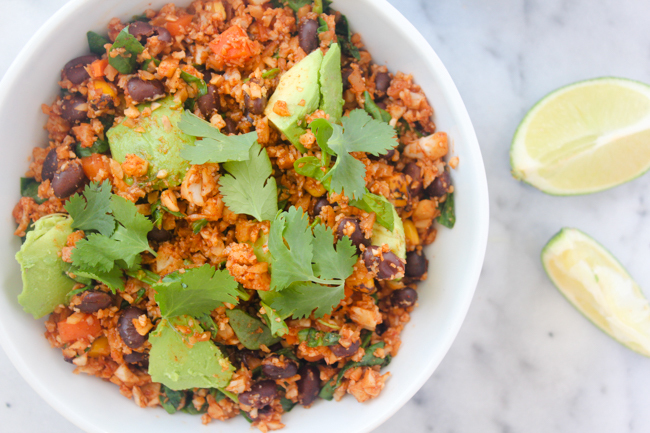 I'm a huge fan of cauliflower 'rice,' I can't wait to try this! Thanks for sharing. I really enjoy the recipe! This is just genius! Recently, since we bought the rice cooker I have more time for new idea. On the source webpage publishing all information about the device. With the rice cooker the process of cooking became faster and easier. Besides, it is easy to clean. Hope you will enjoy it!